In our continued effort to provide innovative, personalized care, we now offer neurofeedback for children, teens and adults. Neurofeedback is a non-invasive, computer-based technique that teaches the brain to function with optimal brain wave patterns. Assessment involves placing non-invasive sensors on the scalp to measure the brainwaves underneath. No current goes into the brain; the sensors just read what your brain is doing. 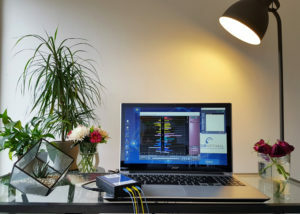 Brainwave data is collected, edited and analyzed to create a Quantitative EEG brain map, also known as QEEG. 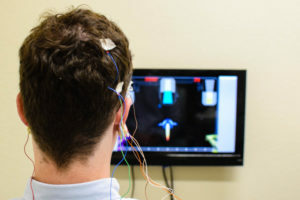 Along with the QEEG, clinical interview and questionnaires are also used in order to gain a thorough understanding your unique symptom presentation. From here, a targeted and individualized protocol is created to help train your brain into a comfortable, efficient state. With sensors attached, you will engage in an audio/visual feedback loop in the form of a movie or a game. When your brainwaves are functioning within a predetermined threshold, a reward is provided to reinforce these optimal brainwave patterns. The reward is stimuli of the movie or points earned in a computer game. When your brainwaves exceed the limit, the reward is not present. The movie will become cloudy or the tone in the game will stop. This process signals your brain that it needs to adjust. As soon as your brainwaves adjust back within the threshold desired, the reward of the movie or tone in the game comes back. Much like going to the gym, progress in training takes time. While some notice changes after only a few sessions, it may take some as many as 10 sessions. Progress is determined by the amount of stable positive change seen in your brainwaves via “check up” brain maps taken throughout training along with your self-report on symptoms. The closer your brainwaves get to becoming optimal, the less symptoms you will likely experience. This effect can be sustained long term if enough training is completed. The number of training sessions to achieve long term results is unique to everyone. Improve performance in school, business and sports.